Why Should You Buy A Gaming Keyboard? Video or computer game input devices can leave a lot to be desired. And probably the least suitable of all the different types of interface available, certainly in the eyes of many people who use their PC to play games, would be the computer keyboard. Despite the fact that it can take an age to learn which keys perform which task, many computer users still rely on what’s known in the business as the ‘WASD’ control system, named after the keys which control the main functions of a game. While the use of such keys is obviously intended to mimic the basic four-direction movement of a typical joystick, it’s obvious that, with so many extra keys available, there’s scope for letting these carry out far many more times different movements and actions. As many shoot-em-ups depend on the speed with which a participant can access the requisite keys in order to be able to wipe out the adversaries, the use of this familiar keyboard matrix to unleash all of the armoury at a game character’s disposal makes good sense. The problem with using a keyboard-based system was that it gave the user little control over the finer aspects of the use of their weapon of choice. And ultimately, with its ability to revolve through 360 degrees, this is why the computer mouse soon took over as the preferred interface. This itself, though, presented several challenges to any user, particularly the challenge of learning how to directly relate the movements of the mouse to those of the character or other item being controlled. Despite those mice themselves evolving to take account of the greater need for movement and ability to turn in every direction, in the main they are basically still very little changed from the offerings of two, or even three, decades ago. It was the realisation that more could be done to enhance the responsiveness of a keyboard than would be possible with a mouse which led to the boffins behind the technology focusing their efforts to provide a more immersive and responsive gaming experience on the keyboard. After all, having 128 keys at the user’s fingertips provides far more scope for exciting new tweaks and improvements in usability than would ever be possible by using the two or three buttons of a mouse. Anyone who uses a computer keyboard regularly will know that the basic function of each key is only a fraction of the story. Additional function and control keys make it possible to give every key up to four different functions and uses. 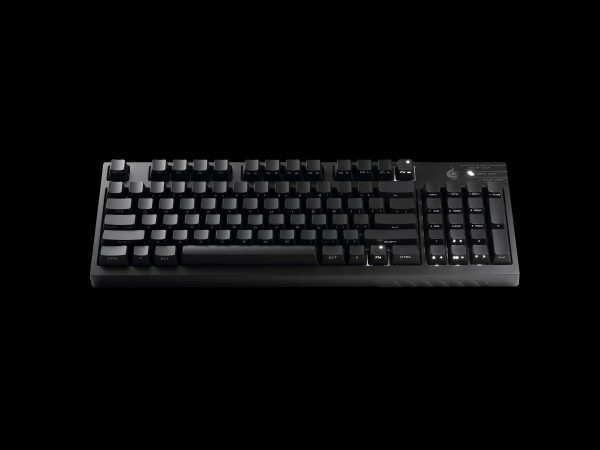 A gaming keyboard goes several times better than this, offering a mind-boggling total of more than 500 individual programmable actions capable of being performed by the basic keys plus, on the SteelSeries Apex, the 22 extra, independent macro buttons. Switching between the different layers of operation is as easy as turning off the upper and lower case function on a standard keyboard, except that this is done by using four quick access keys in the top left corner. Even more impressive is the array of different lighting effects which can be created. Using these, it’s possible to customise the operation and accessibility of any of the group of macro keys. Not only is the light eminently controllable, the same applies to the sounds built into the game. These can be controlled by means of the dedicated media keys also within easy reach on the keyboard itself. These three little words have been the benchmark for the operational abilities of many computer peripherals over the years, and the latest technology now brings this ease of deployment to the latest gaming keyboards, rather than the need on earlier models to install new software, or spend ages ensuring that the interface between keyboard and computer was working correctly. The biggest benefit of using a keyboard over a mouse is that the latest models of the former are fitted with solid, grippy and adjustable rubber feet to ensure that the user can find their ideal working position. So there’s no more looking up to see where your mouse is positioned, or having to reposition it when its pointer reaches the edge of the screen. Keyboard designers have taken their time in developing their answer to the state-of-the-art mice and handsets which commonly accompany games consoles. But the superior array of functions and controllability their interfaces offer make the keyboard – especially in its most modern iterations – the ultimate gaming control device. This article has been supplied by https://www.shop.bt.com/.